Mayberry opened for dinner and brunch this past weekend. After some tantalizing hints of the brunch to come from Chef Josh Campbell, we had already resolved to stop by. Once we saw the menu, we knew we’d have to come for brunch. We had no choice. The maple sausage gravy with rosemary biscuits and poached egg drew David like a moth to a flame. After bundling up, we trekked out in mittens, scarves and layers to brunch around 10. After a few minutes of negotiation, we decided to give in to our impulses and ordered 4 dishes and a few sides. You can stop making that "oink, oink" noise now, please. As you can see from the menu, all mains are under ten dollars, and contain interesting and tasty igredients. I know the dinner menu will change weekly, but I am not sure about the brunch menu. Some of the weekday lunch dishes are on the menu as well. We both ordered coffee, which came in a French press. David approves of the french press, we have one at home, as well as an Ibrik for turkish coffee. A variety of pastries sit by the cash register, if you have any room left. We sure didn’t! We stopped back to bug Josh in the kitchen, slaving away over a pot of fig and brown sugar oatmeal. We enjoyed everything we ordered, but agreed the two standout dishes were the quiche and the rosemary biscuits with sausage gravy. The quiche had some sweet corn in it that we really enjoyed. The goetta had a spice in it that we couldn’t identify, and was a little different that the glier’s goetta that I’m used to. I liked it—the only improvement I would make was that it was a little bit dry. The sausage was excellently flavored and very tasty. I had dug out my favorite mittens from the closet because of the cold weather. (As a side note: Puppet style mittens inject joy into just about every situation). The Elvis Killer was presented beautifully, and was more a dessert than a breakfast, with the flavorful peanut butter mousse. Do you like peanut butter pie? Do you like banana pie? Do you like waffles? Then you’d like this. My mittens like pie. And waffles. We took a lot of our meal home with us for later, but we polished off the two dishes that we really enjoyed. David made short work of the biscuit and gravy. The French toast was tasty, served, with apple butter. It’s cooked a special way so the inside stays moist and the custard is in the center. The rosemary biscuits were huge and delicious with the sausage. The rosemary was not overpowering, but I could definitely taste it. Next time we may put in a special request for a rosemary biscuit, poached egg and sausage sandwich. We didn’t get any bacon, but we tried it on the burger previously and it’s delicious. Breakfast: it's what's for dinner. Great photos! Is this with new camera? yes, it's super awesome! we really like. can't wait to go on a camera trip with you and bob! ;-P I have to wait for my camera to come back in stock. How the hell can we be hanging out less now that you live downtown? makes no sense. Man, the breakfast looks awesome, gonna have to try it soonish. I'll have our Saturday night dinner pictures up tomorrow. BYOB, we totally have to do this sometime. i have been so out of it on reading blogs lately and haven't been here in a while but the blog looks great! pics = awesome. good work guys! thanks liz! Come back soon (to the Cincinnati blogosphere), we miss you! 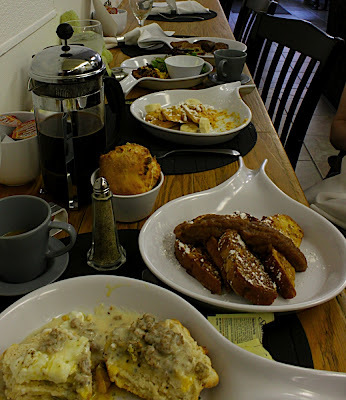 Had a wonderful brunch at Mayberry on Sunday --inspired by your pictures in this post! Elvis Killer & quiche were fabulous! Thanks!